A shed is great help when you need a safe place to store all your gardening equipment. You also need easy access to the tools and you don't want to waste your time finding the tools when they are required. 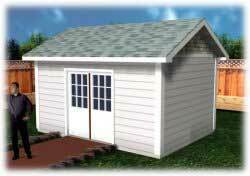 These free shed plans are specially designed so that you can make best use of your available space. The garden tool shed has long-handled storage plus more. This attractive chicken coop has a tilt out window, storage box, chicken door and a regular door. Using cedar fence pickets you can create a strong and sturdy storage shed that is designed to be placed next to an existing building. Build an 8 ft. x 10ft. shed that includes a large window and work bench, ideal for potting plants. This garden shed is designed with doors on each end. 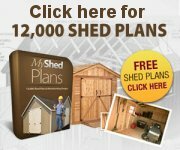 Free plans are nice, but if you want to buy a shed plan instead, check out the selection below. 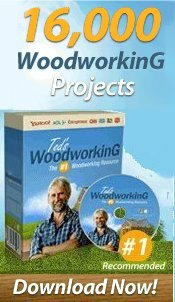 With more than 12,000 easy to make woodworking plans,it's all about choosing the best from the rest. Storage sheds are helpful but only if you design it the correct way. Here's a collection of some of the best shed plans that are very practical to use.